Planning a birthday party for a child? There are so many fun birthday party location ideas! No matter if it’s a party in the comfort of your own home or a high energy arcade, you will have fun creating a birthday party to remember for years to come! This list includes ideas for 1st year birthday parties all the way up to planning a party for a teenager. A private party room in a library is perfect for younger kids who love books. It’s a great quiet space where you can share some fun stories and sing-alongs. An arcade is a great idea for both younger children and older teens. 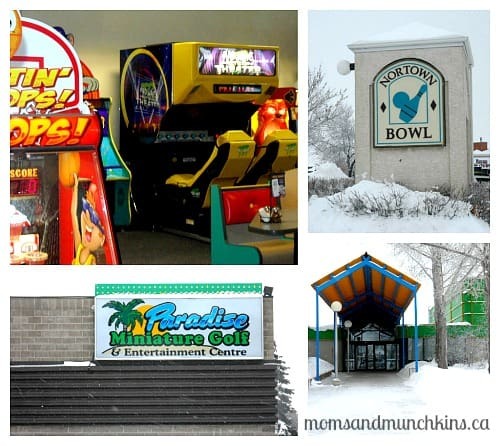 At the arcade, there is something for everyone! A swimming pool (outdoors or indoors) is a perfect location for an Under the Sea party theme. A gymnastics training centre is a great location for high energy kids that would enjoy a sample gymnastics session. Many of these locations don’t accept outside food or drink so you’ll want to check your options before booking. A kid-friendly restaurant with a play area is a great place to let kids run around. Hosting the party in a restaurant also means you don’t have to worry about doing the cooking! Hosting a tween party at a hotel with a pool or waterslide can then turn into a parent-supervised slumber party. For warmer weather, one of the most popular birthday party location ideas is simply outside in a park. A park with a water spray pad is a great way to keep cool while having fun. Sometimes the most simple location can be the most fun. Hosting a birthday party at home means you don’t have as many restrictions when it comes to planning activities, decor or food. Your own backyard can be the perfect location for a party as well. A cleaned out and decorated garage can be a great shaded place to set out food and drinks. Many community centres rent small halls for an inexpensive fee. Some of these halls even have kitchens that you could use to prepare and store the party food. If you are lucky enough to live by one, a theme park can be a really fun location idea for a child’s birthday party. A petting zoo farm is the perfect location for a barnyard theme. Even if you can’t go out to visit them, many petting zoos have small animals that they can bring to you. The beach is an excellent location for a summer birthday party. You could pack along a picnic to enjoy at the beach with the birthday child and all the guests. Did you know that many school gymnasiums are available for rent? This large open space is a great location idea for a sports themed birthday party. Do you have a little one that loves to bake? You could check with local bakeries to see if any offer cake decorating classes for kids. Perhaps the little ones could make their own birthday cupcakes! A museum themed birthday party is the perfect place to plan a fun scavenger hunt. For your little divas, a mini pampering party at a spa would be an excellent choice. Does your little one love pets? Some animal shelters host birthday parties for kids where the little ones get some time with some of the gentle pets waiting to be adopted. This is a great way to donate extra money to your local shelter. For an airplane themed party, contact your local airport to ask if they have any party rooms available to rent. Some may even have a small airplane museum inside that the kids could visit. If your little one loves horses, a ranch would be the perfect location! Many ranches that offer parties also have horse riding activities and a special barbeque menu. All Aboard! If your little one loves trains and you happen to have a train station in your city, you could check to see if they have a party room for rent. A golf course, driving range or mini golf course would be the perfect location idea for your mini golfers. Where do many teens seem to spend more time in than at home? The mall! The mall is a great location idea for planning a fun mall scavenger hunt. For the older kids, a paintball field is an excellent location idea. Do you live near a pier or harbor? If so, there may be a party area to rent near the water. If your birthday child is creative and loves art, check your local art studios for some birthday party location ideas. Many of these studios have planned birthday packages. The zoo is a fun location idea for your little wild child! The bowling alley is always a fun location idea for a birthday party. Most locations have fun birthday party packages that include food and games. For kids that need to burn off a little extra energy, try an amusement park like go karts, a ball pit, bounce houses, etc. Many dance studios offer birthday party packages where the little guests could learn some new dance moves. Although they seem to be difficult to find these days, rollerskating rinks have always been popular on the list of birthday party location ideas. If you can’t find rollerskating, how about ice skating? An indoor ice rink is a great location idea for both boys and girls. A sports centres are an excellent choice for little ones who enjoy sports. A popular arena may offer birthday party packages in the off-season. Is there a tourism cruise boat in your city? If so, check to see if they rent space for private parties. An aquarium is the perfect place for an Under the Sea party theme. Most aquariums offer private party rooms. Do you have a special attraction in your city? Check to see if they offer private party packages. A movie theatre has always been at the top of the birthday party location ideas popularity list. Movie theatre party packages make it easy to plan a birthday party there. Did you know that, upon special request, many theatres will let you show a special movie? Where are your favorite birthday party location ideas? What unique birthday party location ideas have you seen other parents use? Still trying to decide on a birthday party theme? Check out the list of theme ideas on Moms & Munchkins! If you’re looking for adorable party supplies, check out one of my favorites – Birthday in a Box and save 10% off on all orders over $50 – Use code BDAY10 (a Moms & Munchkins affiliate code). We’re always adding creative & new ideas for parties. Never miss an update by following along on Facebook, Twitter, Pinterest and Bloglovin’. We will be planning my daughter’s Birthday Party for March this year – thanks for the inspiration! Thanks for all the birthday party ideas! We have 5 birthday parties to plan for our kids this year. This will be the 2nd year that we book an entire swimming pool. It is surprisingly inexpensive and everyone loves it! This is an awesome list… I have to plan a birthday party for April for my daughter who will be turning 9 so this will be very helpful! Cheryl ~ just letting you know that on Saturday’s I am doing a post every week that is titled Blog Posts I had to share and I plan on featuring this post in it with a link to your post directly. I just love it! Thank you so much, Annie! That’s very sweet of you! Is there a way to see things in specific communities? I thought maybe I can’t see it because you have to join first but I can’t figure out how to join either. Hi Sarah: I’ve written it in a way that it could apply to any city. Sorry, I don’t have a way of listing specific places for all cities. What city in particular are you looking for ideas in? I may be able to direct you to a site that lists them. Hi, you were before me at Best Of The Weekend! Lots of great ideas, here…My son is too old for these now, but it makes me nostalgic for when we used to plan his parties. Great list of ideas. I think it’s great that you gave broad ideas that can be applied to a bunch of cities. Thanks for putting this together.